Cyprus is the third largest island in the Mediterranean. The scenic and sparkling coastline stretches for over 400 miles, ranging from rugged and rocky beaches to blissful golden sands. With family-friendly resorts, picturesque fishing villages, ancient monuments and stunning mountain views, Cyprus caters for a wide range of tastes. Take a walk in the Troodos Mountains, enjoy a fun-filled day out at the Aphrodite Water Park, browse colourful local markets or enjoy seafood meze at a traditional taverna – the choice is yours! Picturesque fishing villages, ancient monuments and stunning mountain views, Cyprus truly has something for everyone. 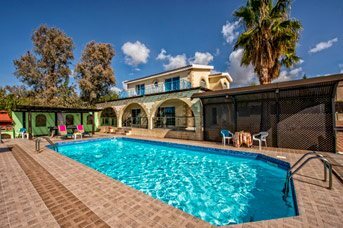 In the Paphos Region, on the West Coast the diverse resorts here range from the lively Coral Bay to more traditional areas of Polis and Latchi. And then there's Protaras in the eastern Larnaca region, which is a firm family favourite. 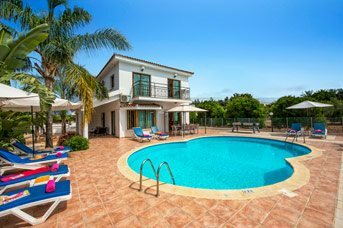 On Cyprus villa holidays, you can take the time to enjoy the country’s warm Mediterranean climate – daily temperatures during the hotter months of July and August in the country usually rest somewhere between 27 and 38 degrees Celsius! 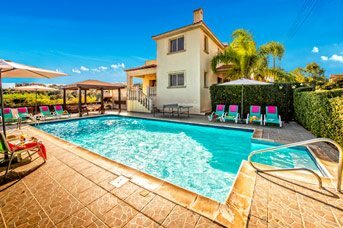 Unwind and appreciate the delightful weather and surroundings either in an air-conditioned rental or by the comfort of your property’s private pool. Situated in the Mediterranean Sea, just south of Turkey and southeast of Greece, Cyprus is an island country comprising over 400 miles of dramatic coastline, complete with sandy beaches and tranquil towns and villages. The country has a balmy Mediterranean climate, with long dry summers lasting from May to October, and mild winters from December to February, separated by shorter autumn and spring seasons. It’s gifted with plenty of sunshine, too, and over the summer months, there’s an average of 11.5 hours of bright sunlight per day! Summer is generally a season of high temperatures and cloudless skies. You can cool of during the night, with air conditioning in all bedrooms. In Cyprus, you can lap up the local culture in traditional restaurants and bars, many of which offer live music and entertainment. There are plenty of bars and nightclubs in all major Cypriot cities and resorts, particularly the renowned Coral Bay area. The main clubbing spot in Cyprus is Ayia Napa, near Protaras, which is known internationally for its nightlife, festive atmosphere and countless bars, pubs and nightclubs. Once ruled by Greek, Assyrian, Egyptian, British and Persian regimes and empires, amongst others, Cyprus officially gained independence in 1959. The country is rich in history, with many archaeological finds left over from previous civilisations. Now, these lost worlds have been uncovered and are here for you to visit – start with a trip to either the House of Dionysos, the Temple of Aphrodite or the Tomb of the Kings. Throughout Cyprus, the typically Mediterranean landscape is blessed with the timeless beauty of antiquity. There are crusader fortresses situated next to tall cypress trees, Greco-Roman theatres carved out of cliffs and Byzantine monasteries perched on mountaintops. Being an island with such a varied and interesting history, there are many places to explore. The wealth of archaeological sites, museums, castles, monasteries and old Cypriot churches are all well worth visiting if you’re wanting to delve into the country’s past. Cyprus is a land of contrasts – just take the untamed wilderness of Akamas National Park, the tourist mecca that is Paphos or the beautiful beaches of Coral Bay and Protaras, for instance. Experience solitary walks in the Troodos Mountains with just wild sheep for company, or revel in the buzzing nightlife of the Coral Bay Strip. Whatever you do here, you’ll leave the country with a thirst to return as soon as possible. Perhaps best of all, for some people anyway, Cyprus is also foodie heaven! The food here is mainly fresh, organic and local. 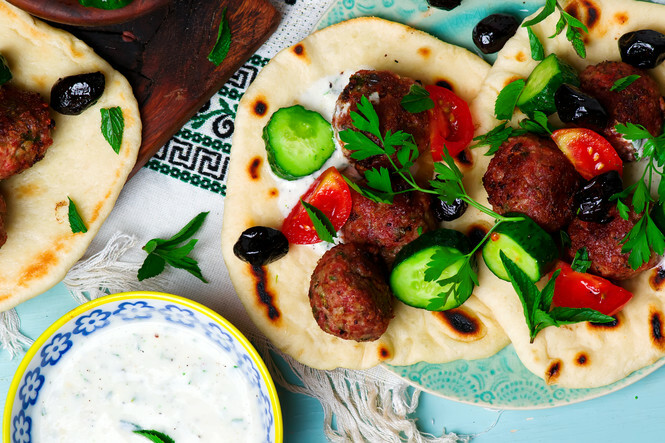 If you want to eat in true Cypriot style, order a selection of meze (the Greek-Cypriot equivalent of tapas) – a big selection of little dishes such as souvlaki, tzatziki, calamari, halloumi, taramasalata, hummus and tahini. Coral Bay is a popular diving site, and as you would expect from the name, there are coral colonies to explore, complete with ancient shipwrecks, underwater cliffs, caves and valleys. Night dives here can be particularly exciting, too. There are many PADI Diving Centres offering diving courses for beginners, so you can enter the water at a pace which suits you. Alternatively, Ithaki Amusement Park is situated in Coral Bay. It’s complete with a mini golf course, a video game arcade and a café-bar, making it ideal for a family day out. Paphos Zoo is also suited to families and is a great place for all animal lovers. There are tigers, giraffes, tortoises and many other beautiful animals to see, along with a bird show which occurs several times a day. Here at Villa Plus, our customers are always at the forefront of our minds. We have a selection of handpicked, self-catering villas which you’ll instantly fall in love with. Whether you fancy a spot of pure relaxation in a peaceful countryside retreat, spectacular patio views at sunset or a property in a central location within walking distance of restaurants and the beach, we’ve got everything covered. As locals to the destination, we’re on hand 24-7 to ensure you have the perfect getaway you’ve been dreaming of. We live and breathe Cyprus and want to make sure that you leave the country loving it just as much as we do. 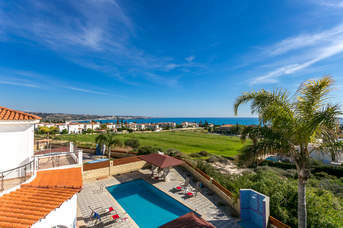 You can choose any one of our many villas in Cyprus and enjoy a holiday you will dream about for many years to come. We know how to make you happy! If you just want to relax under a brilliant blue sky, you’ve come to the right place – the beaches are spectacular, and your own private pool at the villa is perfect for soaking up the rays. Or you might opt for a really active holiday, trying some of the many water sports on offer, or exploring the island. You could head up into the Troodos Mountains, or take a jeep safari on the dirt tracks of the Akamas National Park through a timeless world of carob and olive trees, pine and juniper forests, streams and waterfalls, deserted coves and hidden beaches. In the evening you can venture out to the harbour at Latchi for a great choice of top notch restaurants around the picturesque harbour, including traditional Cypriot food and contemporary international cuisine. This is seafood heaven and we highly recommend the fish meze in this most romantic of settings. If you want to liven things up, the busy main strip of Coral Bay is well supplied with clubs, bars and rustic tavernas serving a Cypriot meze that will challenge the capacity of even the hungriest beach bum or babe! When you need a break from taramasalata and kleftiko, you can try one of the Japanese, Chinese or Italian restaurants. There are pubs if you are feeling homesick, and even a disco open till very late – or do we mean early? Located off a coastal road west of Paphos, Coral Bay is a popular seaside resort. The main attraction here is the 660 yards of sandy Coral Bay Beach, which carries Blue Flag certification and is the most popular in the area. The warm shallow waters are perfect for paddling, while the surrounding bay is a water sports hotspot. Latchi is ideal for a relaxing holiday, with its own laid-back rural charm and culture. There's no sign of noisy bars or high-rise resort-style developments here, with life centring around the authentic Latchi Harbour – a particular highlight for seafood fans. In the early hours of the morning, while you are fast asleep, the fishermen are out catching the fish you’ll eat for dinner. Polis is a small town with a lovable sleepy ambience. In short, it provides the perfect environment to forget about everyday life, helping you to leave any stresses back home. Although it is less than an hours’ drive from the crowds and bustle of Paphos, it is a world away in terms of atmosphere. When it comes to restful and rejuvenating holidays, Polis is hard to beat. The name Peyia refers to quite a large area which includes Coral Bay, St George and Sea Caves. Villa Plus rentals are located near this village, which sits on the hillside with magnificent views across the bay. It has supermarkets, shops, a town hall and a choice of restaurants, bars and cafes. Peyia village is well known for its local tavernas where you can try delicious Cypriot meze. St Georges is situated by a rugged, unspoilt stretch of coast which is right at the edge of the Akamas peninsular. It has undergone development but has still managed to maintain its natural beauty. There is also a small fishing harbour, which has a small, sheltered bay of sand and small pebbles gently sloping into the clear waters, as well as a handful of charming tavernas serving mezes. If you want to visit the region’s spiritual attractions, St Georges is home to a couple of churches dating back to the 6th century. Chloraka Village is around 20 minutes’ drive from Paphos Airport and is located just before the resort of Coral Bay. It sits at a valley with a view of the Mediterranean Sea and has two sides – the upper part, which is where most of the shops, banks, restaurants and tavernas are, and the upper part next to the sea, which is more residential and home to the pretty St George Church. Protaras is located on the southeast coast of Cyprus and is a lively, family-focused resort. Its coastline is lined with sheltered sandy bays, while the main street has plenty of places to eat and drink. It stretches around 10 miles and is divided into many sub-resorts, such as Konnos Bay, Green Bay, Protaras Main Centre, Pernera and Kapparis. Amongst all these resorts, you’ll find lots of places to buy souvenirs, eat and drink. Cyprus is a great destination for a carefree holiday. On this beautiful island, there are fantastic beaches, traditional local villages and archaeological sites to be explored. Nature lovers will appreciate the Troodos Mountains and Akamas National Park. Kato Paphos Archaeological Park includes sites and monuments from prehistoric times to the Middle Ages, while most remains date back to the Roman period. The marvellous mosaic floors of four Roman villas form the impressive epicentre of the finds. This complex includes other important monuments, such as the Asklepieion, the Odeon, the Agora, the Saranta Kolones (Forty Columns) Fortress, the Limeniotissa Ruins of early Christian Basilica and the Tombs of the Kings. The western tip of Cyprus is an area of breathtaking rugged beauty. Only accessible by 4 wheel drive vehicles and on foot, you can explore the many trails and discover the Fontana Amoroza pool and Avakas Gorge. The area comes alive in springtime with over 530 species of plants including orchids providing a blaze of colour. Pack water, sunscreen and a hat and prepare for a mini-adventure. Green turtles and loggerhead turtles nest only in a handful of select locations around the world – Cyprus just happens to be one of those locations. The pollution-free sands of the Akamas Peninsula (particularly Lara Bay) and the beaches near Polis are great for turtles to lay their eggs. Seeing some of these magnificent animals in the wild is an experience you’ll always cherish. Cyprus is well known for its beautiful beaches with golden sands and crystal-clear waters. Coral Bay resort is famous for its Blue Flag beach, while the beaches of Polis and Latchi are where the locals like to frequent. In Protaras area, there are many fantastic beaches with Fig Tree Bay being one of the most beautiful on the island. The best place to soak up the Cyprus sunshine is at the beach, and with more than four hundred miles of coastline, there are plenty from which to choose. Cyprus has a diverse geological terrain resulting in beaches of varying types. Umbrellas or sun beds are generally charged at the standard rate of approx. €2 per day. All the main beaches have parking facilities however during peak season these can become crowded. Moving from the North West of the island and following the coastline to the East you can visit a beach of your choice. The "Blue Flag" is awarded to beaches meeting strict criteria relating to environmental education and information, beach area management and quality of bathing water. In 2006, 49 beaches in Cyprus were awarded the Blue Flag so there are plenty of great options to choose from. Coral Bay Beach is one of the best beaches in Cyprus. It has golden sands and clean, calm waters. The beach also has Blue Flag status, with a few tavernas nearby tavernas if you’re wanting to replenish. This is a busy beach in peak season and is great for water sports lovers. You can also rent sunbeds and parasols here. Corallia Beach is smaller than Coral Bay but still a hit with locals and tourists alike. It is a manmade, picturesque beach and has sunbeds and parasols to hire, as well as toilet and shower facilities. The beach is home to fine golden sands close to the shore, which change to rocks and large pebbles as you enter the sea. The beach lies at the end of the Paphos to Coral Bay Resort bus route. Popular with families, Cavo Maris is named after a hotel and is a small, sandy beach with shallow waters. It is located in the same vicinity as the Lombardi Beach, but it is slightly larger and has water sports facilities available. You can also hire sun loungers, umbrellas and pedalos. It’s close to many public transport options, so you can easily go to and from the beach. Chloraka Beach is situated between the main resorts of Coral Bay and Paphos next to the Chloraka Village. It has golden sands which are protected by rocks so it keeps the big waves away, making it ideal for children. The beach isn’t far from St George Chapel, which attracts both locals and tourists, if you’re looking for to experience other local attractions while you’re there. Fig Tree Bay is the most popular and beautiful beach in Protaras and it has been declared by TripAdvisor as the third best beach in Europe. It has fine, golden sands and crystal-clear waters, making it ideal for families. There are numerous amenities on the beach, including toilets, changing rooms, sunbeds, umbrellas and water sports facilities, as well as a few restaurants. Fireman's Beach or Kapparis Beach is located a little north of the Protaras resort town. It features an amazingly beautiful bay which is decorated by a steep, white limestone cliff, protecting the beach from the winds. To sum it up, the beach is perfect for families as it is compact and secluded with shallow waters. You can also rent sun loungers and umbrellas here. Green Bay Beach is located in Protaras resort and features shallow waters suitable for beginner divers. It is also a great place to avoid the summer crowds. This beach has a few facilities, such as sun loungers and parasols which are available to hire here. The small sandstone platforms to the south of the beach also provide a nice setting for a picnic. Latchi Beach is a short stroll from the Latchi Harbour, along the main resort road. It consists of a long stretch of sand and pebbles and is ideal for snorkelling due to the crystal-clear waters. 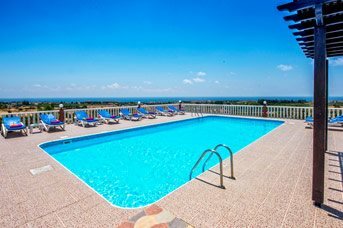 The scenery from here is framed by forested hills, while there are plenty of sun loungers and umbrellas for hire at the beach itself. There are also many tavernas close by, so you can replenish before and after a day at the beach. Lombardi Beach is located on the outskirts of Protaras. It has been awarded the Blue Flag status because of its clean and crystal-clear waters. The beach has many amenities, including sunbeds, umbrellas, toilets and water sports facilities, and the cove has a rocky coastline on either side, giving you that extra bit of privacy. Marlita Beach is a small sandy bay with shallow waters, which is very popular with families and located close to the centre of Pernera, Protaras. Sun loungers and umbrellas are available for hire, and there are a few beachfront restaurants overlooking the bay. The main centre of Protaras is just a short walk along a manmade promenade, following the coastline from Marlita Beach to Vrissaki Beach. Polis Beach is located a short distance from the Polis village square, or around a 30 minute walk from the seafront of Latchi Beach. Next to it is a woodland shaded area of Polis Camping Site, which is used by locals during Cypriot public holidays. Polis Beach has a mixture of coarse sand and shingle, with stones and pebbles in the water. You can hire sunbeds here and there are also toilet facilities. Trinity Beach is locally known as Ayia Triada Beach and has a small white and blue church that sits above, looking down over the sand. The translation of Ayia Triada is Holy Trinity, hence the name Trinity Beach. This beach is a small sandy bay with shallow, calm waters and is very popular with families. Sunbeds and parasols are available for hire. 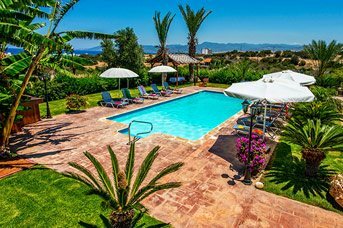 It is a short distance from the Kapparis centre, located near the Ocean Aquarium Park, just off the main Kapparis roundabout. Bars, cafes and a large patisserie are a short stroll from the beach. The beach of Protaras sits next to Vrissaki Hotel – this is why it’s sometimes known as Vrissaki Beach. It has a long strip of fine golden sand and shallow waters which are well suited to snorkellers. Awarded Blue Flag status for its cleanliness and water quality, this beach is just a short distance from the Protaras resort centre. There are also water sports facilities, sunbeds and parasols available to hire. The beach has lifeguards between 9:00am and 6:30pm, disabled access and toilet facilities on site. White River Beach is a beautiful sandy cove situated at the edge of the amazing Akamas Peninsular. It has clear water and is great for bathing and swimming. There is a small beachside snack bar on hand and toilet facilities are available at a nearby taverna. There is a single track, concrete road leading down to the beach, and the last 550 yards needs to be completed on foot. Cypriot cuisine takes influence from Europe, Africa and Asia, catering for a range of different tastes. Fruits and vegetables are freshly picked, while Cypriots often pride themselves on their tasty homemade breads. Towns and villages tend to have traditional souvlaki shops, serving up chicken or pork kebabs, either in pita bread or on a platter. They also serve delicious gyros with beef. Fresh fish is caught and served by the attractive harbourside tavernas, the perfect spot for a lazy lunch or to watch the sun set. There are vineyards dotted throughout the countryside and many local villages produce their own liquors if you're feeling brave! The Old Town of Paphos has a partially covered farmer and retailer market, where you can purchase all kinds of good such as fresh fruits and vegetables, fish, lace, leather and therapeutic olive oil products. It's worth a visit on a Saturday morning, as this is when the knowledgeable locals tend to go. If you are staying in the Protaras area, head to the Farmers' Market which is held early on a Saturday and Sunday morning in the nearby village of Deryneia. It starts at 7am and finishes up at 1pm, giving you the chance to buy fresh fruits and vegetables. 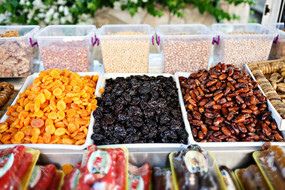 Alternatively, take a visit to the market on the outskirts of Larnaca, held every Sunday between 9am and 1pm. In Cyprus, you can discover an impressive variety of local cuisine. The meze dishes are popular and typically comprise of Greek salads, olives, kleftiko (slow cooked lamb), afelia (pork with coriander seeds), stifado (beef stew) and potatoes, along with dips like hummus, tzatziki, taramasalata and tahini on the side. 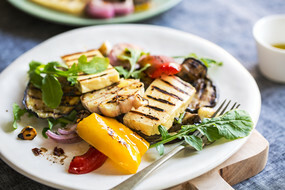 Halloumi - Halloumi is probably the most popular Cypriot food because it possesses the rare ability to be easily fried or grilled, completely redefining the expectations of ‘grilled cheese’. It is produced by combining a mixture of goat and sheep milk and can also be served up cold alongside freshly sliced watermelon. This is commonly eaten as either an appetizer or a dessert in Cyprus. Stuffed Vine Leaves - Stuffed Vine Leaves (koupepia) are made of minced meat, rice, onions, tomatoes and a mixture of herbs. This filling is then wrapped carefully in fresh vine leaves. It is usually made in large batches and can be frozen, so it can be enjoyed later. Sheftalia - Sheftalia is Cypriot style sausage dish which is made using lamb and pork meat. It is wrapped in sheets of caul fat, which is rendered over a live fire. As the fat drips, little towers of flame lick the meat, creating a super crusty exterior that's still moist and juicy inside. Kleftico - Kleftiko is a lamb cooked for around 2-4 hours in a clay oven with lemon juice and cinnamon. Join the locals at a taverna and take your time over this flavour filled speciality. This is an easy Greek recipe for flavour-packed, tender meatballs with a crispy crust and a lemony sauce. It can be eaten as an appetizer, but it also can be served as a Greek-style dinner bowl when combined with Greek-style salad, tzatziki sauce and pita bread. Take a large frying pan and heat 2 tbsp. olive oil over medium heat. Add onions and garlic and cook until golden and translucent, stirring regularly. Transfer the onions and garlic mixture to a large mixing bowl to cool. Set aside in a frying pan for later. Wring the excess milk out of the soaked bread. Add the bread to the mixing bowl. Add the ground beef and lamb (or pork) to the mixing bowl, along with 1 egg, fresh mint, spices, salt and pepper and 1 tbsp. lemon zest. Mix by hand until mixture is fully incorporated. Form the meat mixture into balls (each the size of a heaped tablespoon.) Roll the meatballs into the flour to lightly coat and place them on a large tray for now. Add 1/4 cup olive oil to a large skillet and heat over a medium-to-high heat. Turn heat to medium and add the meatballs. Fry them for 10 minutes or so, turning occasionally until they’re cooked and well-crusted on all sides. With a slotted spoon, remove the meatballs from the frying pan. Place them onto paper towels to drain any excess fat. Meanwhile, carefully discard most of the cooking fat from the frying pan – it’s best to dump it into a tin can until cooled. Put the skillet back onto the stovetop over a medium heat. Whisk 1 egg yolk with the chicken broth and lemon juice. Add to the cooking skillet with the remaining lemon zest, then put the meatballs back in. Cook over medium heat for another 5 minutes until the lemon sauce thickens.